How do I find recently deleted text messages from iPhone 7? How do I find recently deleted text messages from iPhone 7? How to recover iPhone 7 messages recently lost? Read here to retrieve messages from iPhone 7 recently deleted. It would be quite understandable that many people face the text messages deleted or lost problem when they got the new iPhone 7, for Apple has added new function to Messages app in iPhone 7, which may cause some accidents to delete text messages from iPhone 7. So is there any way to find recently deleted text messages on iPhone 7? How to retrieve iPhone lost messages? Don't panic and just keep reading, you will find a way to recover those iPhone text messages recently deleted. First question, did you have an iTunes or iCloud backup for your recently deleted messages on iPhone 7? If you do, it would be easier to retrieve lost messages by restoring from iPhone backup directly. But to some people, maybe an iPhone backup extractor will be a better choice, for it will not wipe or clear any other data on your iPhone, unlike restoring from backup data directly. 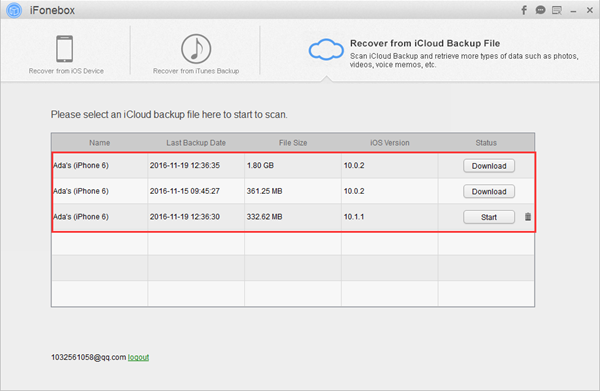 Also read: How to restore only deleted messages from iCloud backup? The second question, is it possible to find recently deleted text messages from iPhone 7 if no backup? Definitely yes. Within the help from iFonebox, you can also recover lost text messages on iPhone easily. So what is iFonebox? What can iFonebox do for you? 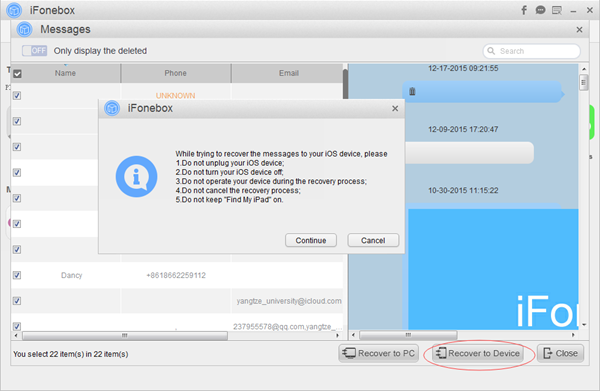 As is known that iFonebox is a professional iPhone text messages recovery tool which can not only recover recently deleted or lost text messages on iPhone 7 Plus/7/6s Plus/6s/6 Plus/6/5s easily without backup, but also extract and find lost data from iPhone backup(iTunes & iCloud)selectively. Plus, you can transfer retrieved text messages back to your iPhone directly via iFonebox, so cool. Next, I will show you how to get back lost text messages from iPhone easily. It is necessary to download and install iFonebox on your computer firstly. There are two versions accessible: Windows version and Mac version. Just click on the below icon to download. Step 3. Preview and select messages to recover to iPhone. Now you can select those deleted messages and then, click Recover to Device button. Once clicked, just follow the reminders pop-up from the software. You need to turn off Find My iPhone in advance. After restoring, your iDevice will be restarted and then upgrade. Once all are done, those deleted messages have been in your iPhone safely and successfully. There are two iPhone backup modes: Recover from iTunes Backup and Recover from iCloud backup mode. Here, I will take Recover from iCloud Backup mode as example. Step 1. Launch iFonebox. Choose Recover from iCloud Backup mode in the main interface of the program and then, you will need to sign in with your Apple ID and password. Remember to turn off your two step verification ahead. After that, you have the chance to select your iCloud backup to download. Step 2. 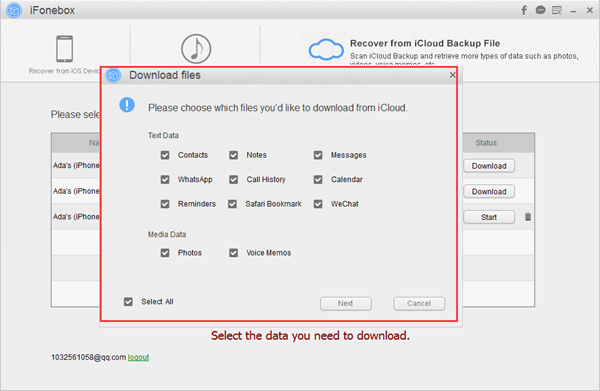 Download messages from iCloud backup. After you have selected one iCloud backup to download, iFonebox will start the downloading process. Also, you can select only messages to download to save more time. Step 3. Scan and preview lost messages from downloaded iCloud backup. After downloading process finished, you are able to access and view those lost messages from iCloud backup. Just click on Messages item and scan lost data from it. You can transfer recovered messages back to your iPhone directly. The above are the whole process to find recently deleted text messages from iPhone under the help from iFonebox, pretty convenient, isn't it?